Ten privacy groups in the US have filed a complaint to the Federal Trade Commission over Facebook's new privacy settings. They argue that privacy on the social networking site has been adversely affected as the firm encourages users to open up their profiles. The company changed its privacy settings, ostensibly to make it easier for users to control their profiles. But it also made it easier for content to be shared with all Facebook users. 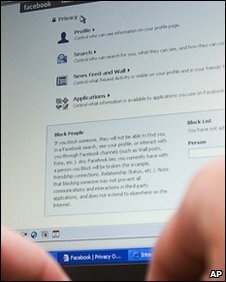 The idea that personal photos and comments can be seen by all 350 million Facebook users has angered privacy groups. The complaint, filed by the Electronic Privacy Information Center and signed by nine other privacy groups, argues that the recent changes "adversely impact users". "Facebook's changes to users' privacy settings disclose personal information to the public that was previously restricted," the complaint read. "These changes violate user expectations, diminish user privacy, and contradict Facebook's own representations," it goes on. It urged the Federal Trade Commission to investigate the social network site. Facebook said in a statement that it had discussed its privacy programme with the FTC before making the changes. Chief executive Mark Zuckerberg himself fell victim to the new settings, when newspapers and blogs published some of his personal photos. He said in his blog that opening up access was deliberate. "I set some of my content to be more private, but I didn't see a need to limit visibility of pics with my friends, family or my teddy bear :)." Facebook is encouraging users to make their profile information more widely available. There are three settings available: Friends, Friends of Friends, and Everyone. It recommends that users favour the third, and most open, setting for status updates, photo albums and basic information while contact information should be reserved just for friends. Google and other search engines are keen to include social network information in its indexes. Rival social network Twitter offers users limited ability to restrict who sees content. Such openly available information would also make it easier for social networking sites to target users with advertisements.